Do: Buy an unlimited ride 7-day MetroCard (good for all subways and non-express busses) if you’re visiting for 4 or more days. At $31 plus a $1 new card fee, it’s more than worth it for ease, convenience, and peace of mind. Check mta.info before you head out so you’re aware of services changes. Do: Try not to feel flustered if the local subway train starts going express or if your A train starts running on the F line with no prior warning. Being inconvenienced by train troubles unites all of us as New Yorkers. You’re now this much closer to feeling like a local. Do: Ask strangers for directions. In fact, ask a few people to get a consensus. Some commuters only know their specific route, so they might give inaccurate advice sometimes. I definitely sent a few British tourists to the opposite of where they needed to be my first few weeks in NYC. Whoops, my bad. Do: Eat a slice of pizza, folded, while standing against a counter. Here are a few places to try. Do: Get out of Manhattan and visit an ethnic enclave in an outer borough. New York City is composed of 5 distinct boroughs, so make sure to explore outside the postcard-y center of Manhattan in order to see how the city’s 8 million-plus residents really live. Try Asian enclaves in Flushing, Queens or Sunset Park, Brooklyn; the Russian neighborhood of Brighton Beach, Brooklyn; or the Himalayan, Indian, and South American section of Jackson Heights, Queens. Do: Follow subway etiquette. Take off your backpack on a full train (seriously, it hurts when it digs into my back), don’t hog the pole, etc. This is a crowded city so be mindful of everyone’s personal space by trying to take up as little room as possible. Do: Go to a Broadway or an Off-Broadway show. There’s a kinetic energy to the theater scene in New York. 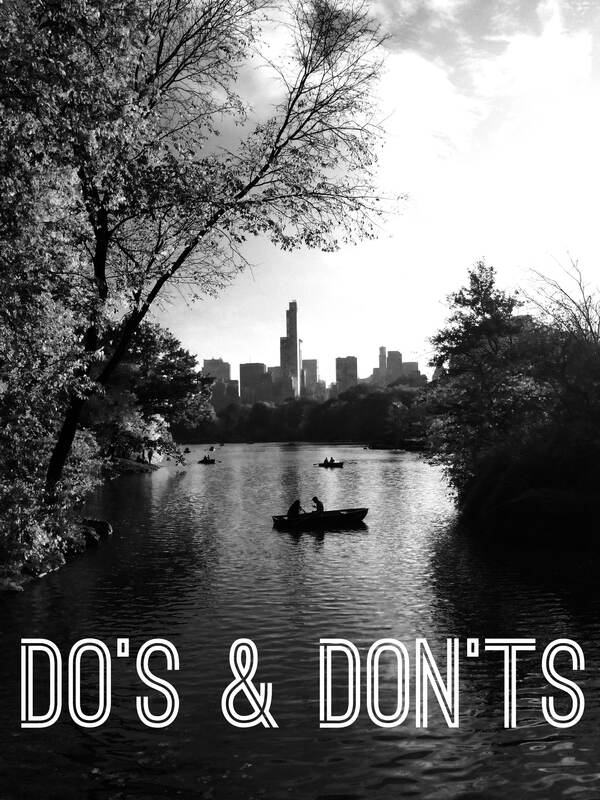 Do: Devote half a day to exploring Central Park, especially if you’re blessed with good weather. It’s the size of a small city, and every section has its own vibe. Do: Pick a spot to people watch and park yourself there for at least an hour or so. A bench in Washington Square Park or one on the Mall in Central Park are two of my favorite spots. Do: Find a nice perch for sunset. They may be crowded, but Top of the Rock and One World Observatory offer some of the best views. Do: Dress up and go out to a nice meal, if it’s in your budget. The dressing up part is key–you’ll feel a part of the only-in-NYC nighttime energy. Here are a few restaurants at which to make a reservation. If a fancy meal is out of reach, try a fancy cocktail at one of these spots. Do: Chat up your bartender if you’re at a low-key spot. It’s not often easy to engage with strangers in New York (as mentioned above, we’re really into maintaining some semblance of personal space), but there are plenty of moments for connection. These can include a shared smile with a fellow subway rider at something ridiculous, or a quick laugh with your bartender. The latter is why my husband and I love eating at the bar at nice restaurants. Do: Tip good street performers. NYC is filled with world-class musicians, and you’re by no means obliged to tip, but if you enjoyed the music, why not show your appreciation? Please note that busking on an actual subway car is illegal, so you definitely shouldn’t feel guilty for not tipping there. Do: Walk with purpose if you’re in a crowded spot like Midtown. You’re allowed to stroll, of course, but if you’re going to walk slowly, please move to the outskirts of the sidewalk. Do: Keep your eyes open. NYC rewards the observant. There’s a surprise lurking around every corner. Don’t: Take anything that’s offered to you on the street, especially CDs or any kind of “peace” medallions. Better to even ignore those handing out seemingly harmless flyers. The two exceptions are free daily papers and weekly magazines–AM New York is handed out each morning and Time Out New York is distributed on Wednesdays only–and free samples given out by businesses outside their storefronts. Don’t: Try to see everything that’s on offer at the Met museum in one day. Pick a few sections of particular interest and spend a few hours there. I’m of the mind that no person, unless they’re an aficionado, can look at art for more than three hours or so in a single day without getting art-appreciation fatigue. Don’t: Assume that ballet or opera tickets are out of reach. I once snagged $10 orchestra seats to a New York City Ballet production. The interiors of the various Lincoln Center theaters are something to behold. Don’t: Get on a suspiciously uncrowded subway car on an otherwise crowded train. No, you did not luck out; it’s empty for a reason. Don’t: Stare at people doing strange things. If they’re not a danger to themselves or others, let them be. Don’t: Stay somewhere or near someone next to whom you feel uncomfortable for the sake of being polite. If that same person doing strange things is making you feel at all uneasy, move elsewhere. Trust your instinct, and if the worst that happens is someone thinks you’re rude, that’s a pretty good outcome. Don’t: Walk in an isolated corner of a park after dark. For the larger parks, like Central and Prospect, yes, it’s a safety issue, but for all parks it’s a rats issue. There are so many rats. It’s like that rat crypt scene in Indiana Jones: The Last Crusade. Okay, I may be exaggerating, but seriously, it’s gross. Don’t: Be afraid to leave your comfort zone. Whether it’s trying lengua (tongue) tacos in the back of a Mexican grocery or belting out musical theater tunes at a piano bar like Marie’s Crisis, this city is the place to break free of your inhibitions. Don’t: Leave without making plans to come back. We’ll miss you. Don’t be a stranger.